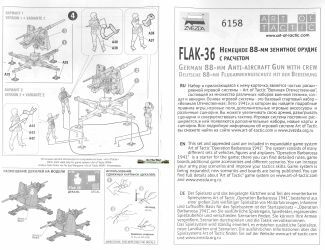 Hasegawa Flak 36 by Al Magnus. I've come to like the new releases by Zvezda. Not only are they cheap, but they also assemble easily, are reasonably well-detailed (considering that they are actually meant for wargaming, we could say that they are very well detailed), while the poses of the figures are realistically done and chosen such that they make for an instant vignette. Zvezda keeps the desires of the static modeler in mind, though, as you have the option of installing the gun and figures on a substantial plastic base, or keep them all separate. Even when most static modelers will go for the latter option, the base will be a handy rig for alignment, while making handling during the painting stage easier. One other thing I appreciate about Zvezda's offerings is that they are no box of chocolates as the images on the back show exactly what you will get. Furthermore, the boxart generally corresponds very well to the content as well and helps with painting. 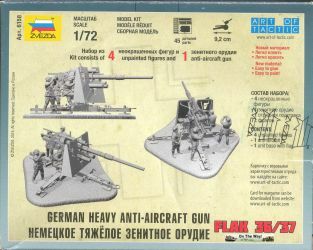 The gun comes with four figures: two loaders, a gunner and a commander, all in poses that correspond to the ground firing role. 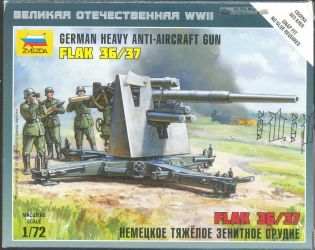 I understand that the typical crew of an 8.8cm Flak consisted of a dozen people. Zvezda has molded one of the aiming wheels integrally with the hand of the gunner, ensuring a realistic grip, but a separate wheel is provided as well for modellers that want to show the gun without a crew. 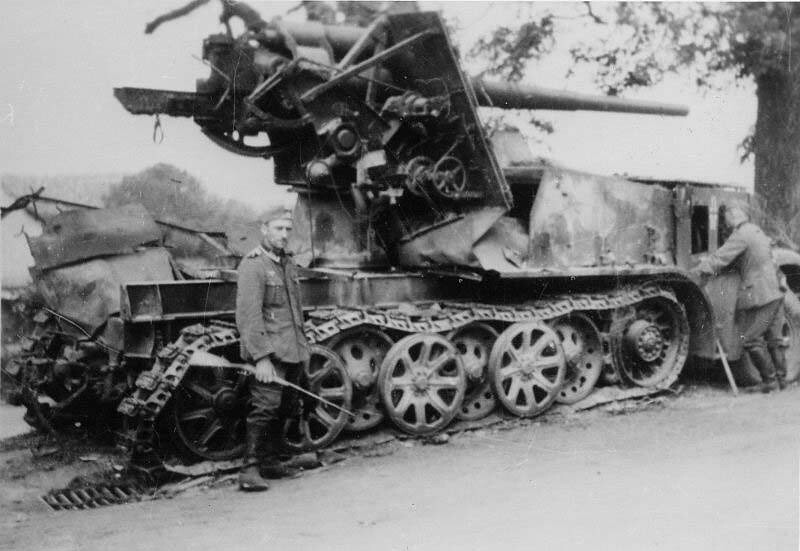 The wheeled carriage for the gun is not given, while the only ammunition that is provided are the two rounds held by the loaders. The base plates for the outriggers are both given as separate parts and as an integrally cast detail on the ground base. Assembly can be done without the use of glue, even though most modelers will choose to apply a few drops after all, just in case. The plastic is hard enough to be cut, scraped and sanded, and soft enough to react well to most standard glues. A painting guide is not given, but the boxtop can help, showing the gun in Dunkelgrau, which is entirely accurate for any early to mid war setting, but as the gun was in use right until the last days of the war, a modeler preferring Dunkelgelb will not be left out in the cold. Even then, I feel a bit of extra help in the form of color call-outs for gun and crew might not have been unwelcome for some. The instructions are simple, but more than adequate, and very clear. Based on Al Magnus' identification guide (vide supra), this kit depicts a Flak 36, not a Flak 37, which means that the boxtop is not entirely correct (even though the instruction sheet more accurately only mentions "Flak 36"). 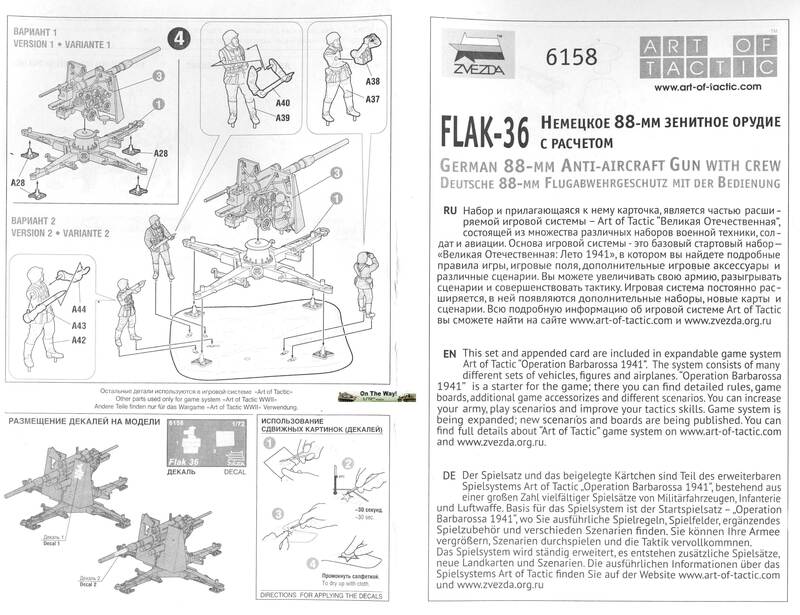 For a wargaming kit, you will get a highly detailed and generally accurate Flak 36 however. A case in point are the rivets which seem just right for this scale. The inevitable ejector marks are strategically placed where they will easily be removed. Even though the engineering of the kit is such that the barrel can be put at any elevation, the equilibrators' position corresponds to a low elevation, but the needle indicator would only be correct for a high elevation. The crew's position, on the other hand, is definitely only correct for the ground firing role. This is confirmed by the observation that the shield for the direct firing optics is in the open position. The way the kit is engineered also allows for easy omission of the shield, as sometimes seen in wartime pictures. The gun barrel, while very nicely rendered with a convincing collar, will get an accuracy boost if the business end is hollowed out. The figures are nicely sculpted, as we've come to expect from Zvezda, and the gun itself is nicely detailed. They wear the early war M1936 tunic. Zvezda has paid attention to the details as one of the loaders wears gloves protecting him from the heat of spent rounds. The rounds themselves, on the other hand, are rather on the small side. 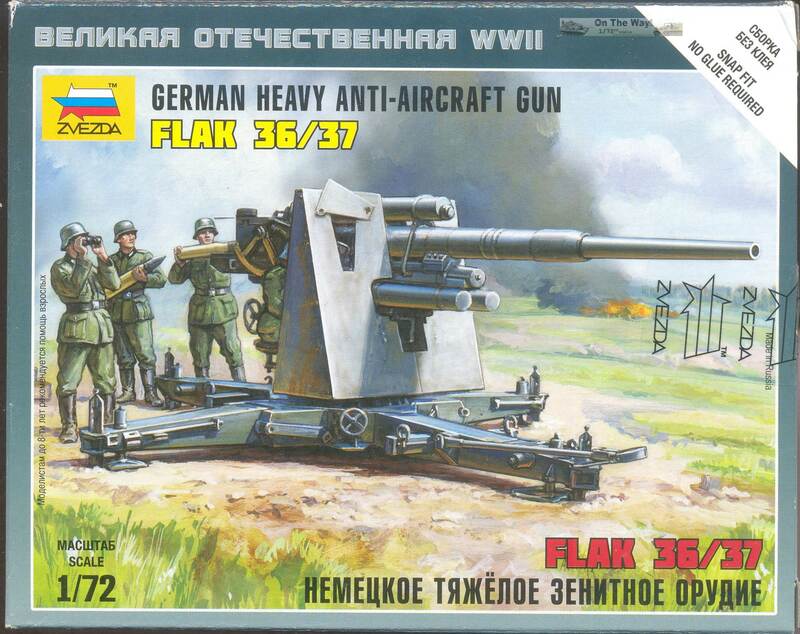 The rounds for the Flak 36 were the same as those of the KwK36. A complete Pzgr.Patr. for that gun should measure 873mm (12.12mm in 1/72) . The rounds in this Zvezda kit are only 10.23mm long. The calibre is very close to 88mm, though. 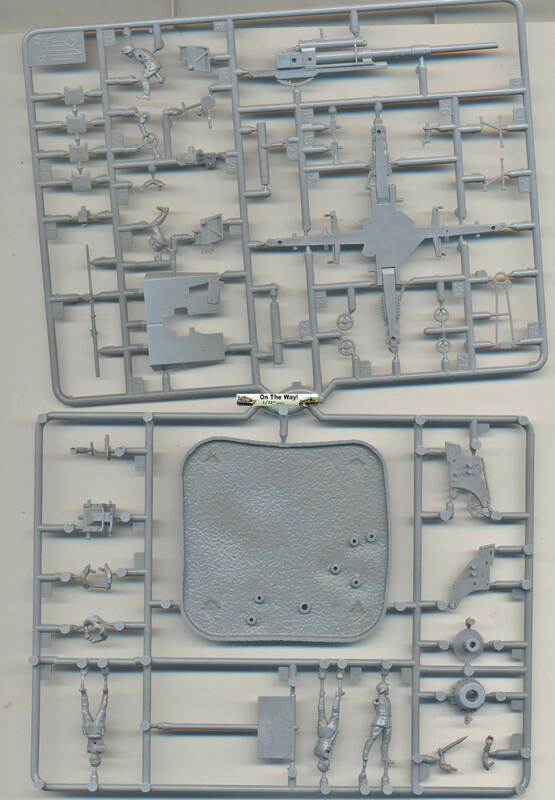 As any reasonable diorama will need extra rounds from an aftermarket set, the modeler would be advised to replace the rounds in the hands of the figures with those from that same set for consistency. Even though the figures are nicely sculpted, molding limitations are visible where the two mold halves meet. In this area, the detail is almost non-existent. Fortunately, this is mostly situated in places where detail (like pockets or belts) can be recreated with patience and a sharp scalpel. 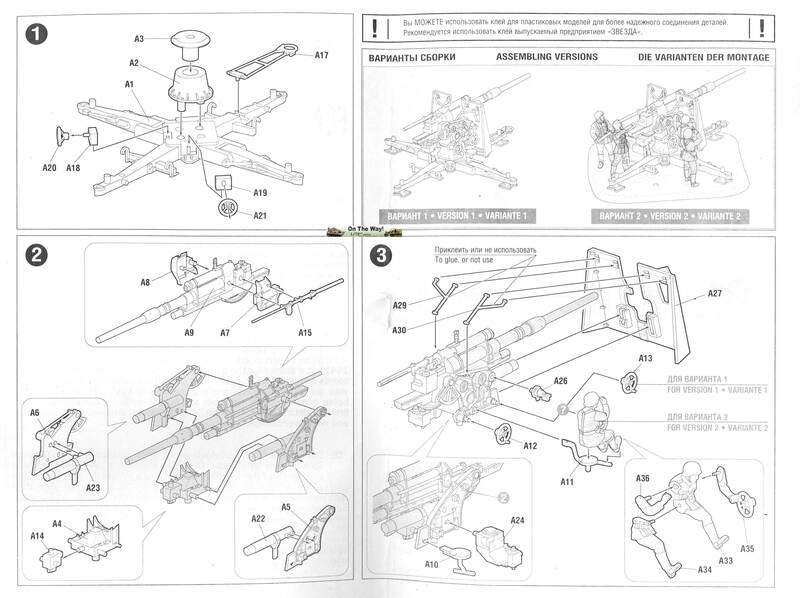 Construction is very easy, as can be expected from a snap-together kit with few pieces, but don't be fooled, Zvezda has had to make next to no compromises to end up with a well-detailed result. 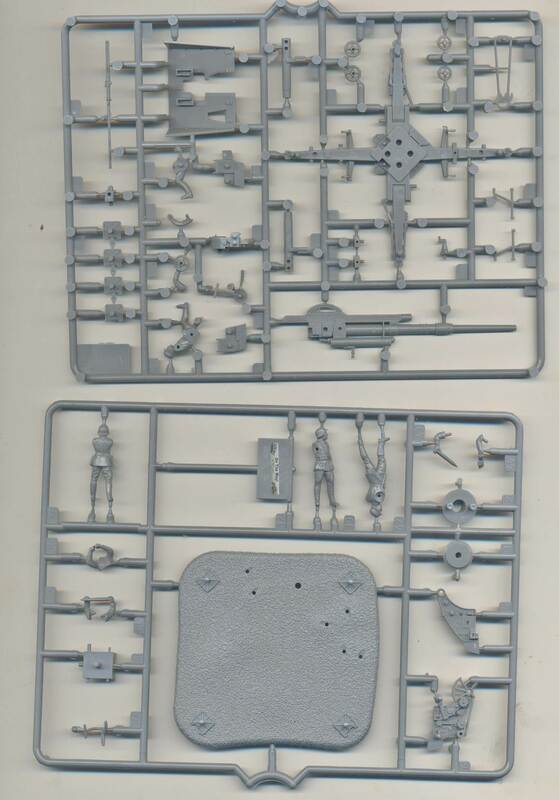 Compared to the Hasegawa kit for instance, Zvezda includes the supports for the gun shield, which admittedly need to be glued if they are to be used. 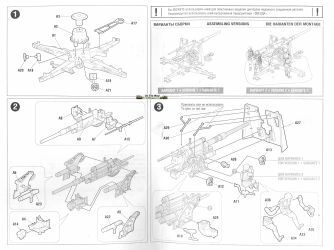 One also has to note that Al Magnus complained about the over-engineering (with too many subassemblies) of the Revell kit. The Zvezda kit sits on the opposite side of the spectrum in this respect. Parts 18 & 19 need to be installed before part A2, or there will be no way to install them without black magic. The outriggers have some ejector marks. These happen to be exactly the same diameter as the flag pole (which non-wargamers will not use), which can serve as a donor for fill-in slices of plastic. 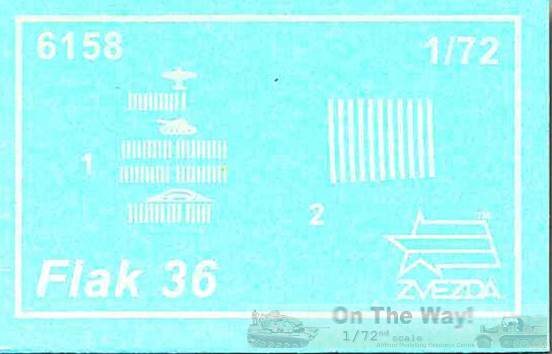 As the Zvezda plastic is soft, generous use of MEK will easily get rid of these marks. Most other ejection marks are hidden behind parts after assembly. I inadvertently shaved of a small hook (?) on one of the outriggers while cleaning up the seam lines. In general, these seam lines are very subtle and easy to remove by scraping with a new scalpel. Mold alignment is very good, with the exception of the bottom of the gun equilibrators. This, in combination with subtle seam lines, results in a single piece gun barrel that is perfectly round. (No problem with getting two halves of a gun tube to get along.) Drilling out the muzzle with a fine drill goes a long way in improving the barrel to a point that a metal replacement barrel would be no real bonus. Apart from the gun muzzle, the only improvement that should be done in my opinion is the creation of the gun slide (behind the barrel). This can be done by removing some plastic and creating a "through". 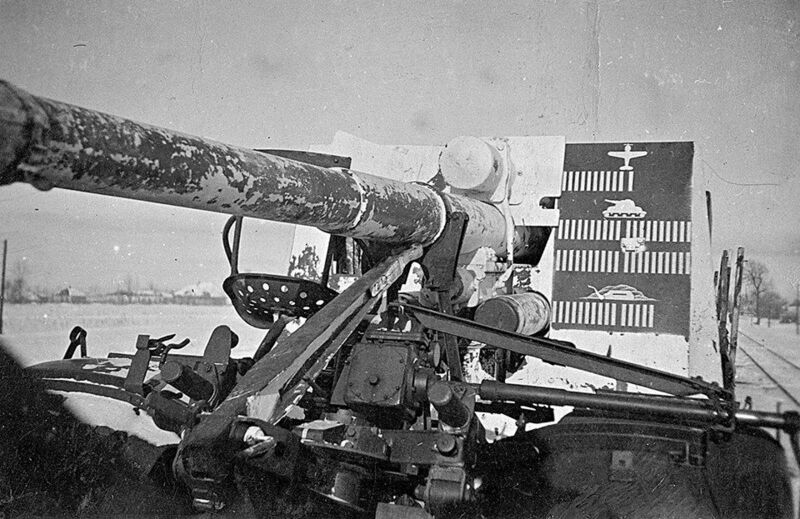 A minor additional improvement that I chose to perform was the addition of a small disk on top of the gun breech, to the right. No other superdetailing was done. Even though I glued all pieces in place, the snap-together nature of the kit makes it child's play to keep the parts in place when applying the glue. The toothed ring segment on the bottom of the gun slide should probably engage with the elevation mechanism. In this kit, it doesn't touch anything. I have no idea what the rod on the left side of the barrel is (running parallel with the gun, to the rear), but it is shown in the drawings in . 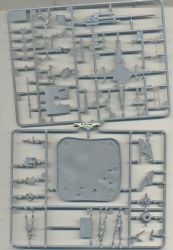 It is not included in the Revell kit however. 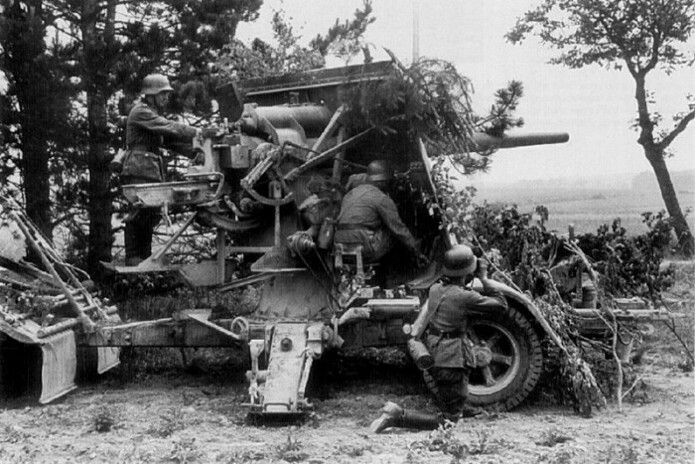 Some 8.8cm Flak guns that were used exclusively in the anti-tank roles had a modification to the gun laying controls. The rear handwheel (for elevation) was removed and an extra handwheel added in the area of the front handwheel (for azimut). A chain drive coupled this back to the elevation mechanism as can be seen here or here. I didn't use the crew on this gun, as I needed it for another project. Incidentally, this allowed me to build the gun at a certain elevation, corresponding to the needle indicator and gun equilibrator configuration. My idea behind this was that the gun was being used in a dual role, having last fired at Jabos, but with the direct firing sight still open from recent anti-tank combat. You only get one type of gun shield. The movable flap for the direct firing device is molded on the shield in the open position only. You get no Sd.Ah. trailer or Kommandogerät. The gun cannot be built in transport mode. The ground stakes are molded in the stowed position. You get some nice figures. It's much easier to construct. I painted the gun dark grey and added decals from Fantasy Printshop. Tigr boevoe primenenie germanskih tjaelyh tankov (cyrillic), Tornado.